IOS App Developer: Tactus Therapy Solutions Ltd.
Harness the power of a scientifically proven 4-in-1 speech therapy app that boosts reading, writing, speaking, and listening in people with aphasia. Whether you’re recovering from a stroke or brain injury, Language Therapy can help. STUDIES SHOW… IT WORKS! Struggling with language can feel like being trapped in your own mind. But there’s an answer. Research at the University of Cambridge showed improvement in every single participant with chronic aphasia who used this app for 20 minutes a day over 4 weeks. Get real results that last. 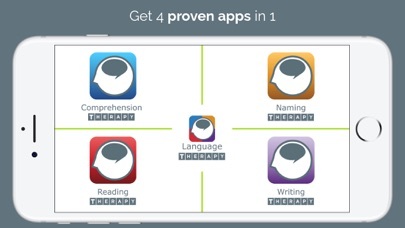 * - Overcome aphasia and boost language skills with a proven app designed by experts - Save big with 4 apps in one – a 25% discount over buying them individually - Enhance speech therapy with countless activities that are perfect for clinical and home use - Learn in 5 languages: US or UK English, Spanish, German, French - Get a toolkit that’s faster and more adaptable than photo cards, letter tiles, and other therapy aids - Use score reports and adjustable options to seamlessly fit the app into your therapy program - Fully customize your activities by adding your own words, pictures, prompts, or sounds - No subscriptions, ever – our best-selling app will always be there when you need it ** THERE’S NO BETTER TIME TO START. Try it now for FREE with Language Therapy Lite! 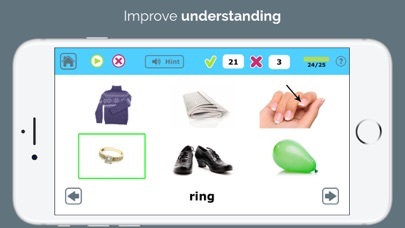 ** HERE’S WHAT YOU GET IN ONE EASY PACKAGE: COMPREHENSION THERAPY – IMPROVE YOUR UNDERSTANDING Build listening and reading comprehension skills for nouns, verbs, and adjectives. Take the first step in your aphasia recovery with an app that automatically adjusts difficulty based on performance. 3 ACTIVITIES: Listen | Read | Listen & Read NAMING THERAPY – FIND THE RIGHT WORDS Practice naming and improve word-finding skills. In 4 activities, you do everything from naming the things you see to describing their features, all with cues and hints to guide you. Build independence by learning strategies to communicate your thoughts and needs. 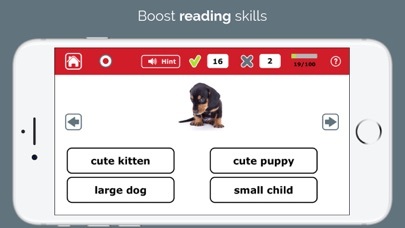 4 ACTIVITIES: Naming Practice | Describe | Naming Test | Flashcards READING THERAPY – TAKE YOUR READING TO THE NEXT LEVEL Strengthen literacy with phrase and sentence exercises in an app that’s perfect for independent practice. Improve attention to detail, practice oral reading, and build on the single words of Comprehension Therapy as you move toward the more advanced reading skills needed for independent living. 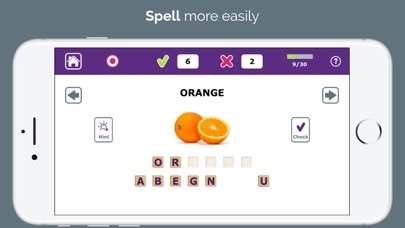 4 ACTIVITIES: Phrase Matching | Phrase Completion | Sentence Matching | Sentence Completion WRITING THERAPY – BOOST YOUR SPELLING SKILLS Improve spelling ability by practicing completing and building the words you hear and see. Pick letters from a limited choice or full alphabet, then place and rearrange them at will for an intuitive and challenging experience. The perfect spelling practice is waiting. 4 ACTIVITIES: Fill in the Blank | Copy | Spell What You See | Spell What You Hear IN ALL 4 OF LANGUAGE THERAPY’S APPS, YOU GET: - 700+ core nouns, verbs, and adjectives that run throughout all 4 apps - Thousands of exercises for countless hours of practice - Recommendations on what to do next based on your score - Activities for people struggling with aphasia after stroke or brain injury, autism, or just learning a new language - Simple, distraction-free interfaces that are easy to use for all ages and abilities - No subscriptions, no monthly bills, no Wi-Fi needed WHY WASTE YOUR TIME ON APPS THAT DON’T WORK? Download Language Therapy and watch the improvement begin. ** DOWNLOAD IT NOW, or try it for free with Language Therapy Lite! 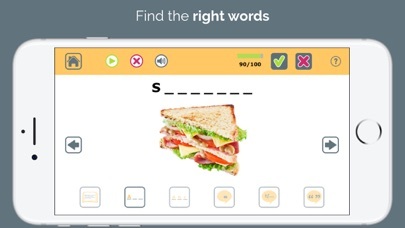 ** Looking for something different in a speech therapy app, or only interested in one of the apps in Language Therapy? Find the right apps for you at tactustherapy.com/find *Every person and every brain is different. Your results may vary. This is a great app. It's intuitive and easy to use. The customized lists are really helpful when you need to tailor the exercises to the individual. It's particularly helpful for home practice. I spoke with customer service to ask a few questions about the app. They were quick to respond and helpful; they even gave some kind words for one of my patients. It was a nice surprise to see this software company had a patient-centered mission. Love this simple app for basic language. I used the lite version for a long time but I always wanted to buy all of it so that I could use it more extensively with patients with aphasia. The patients love the pictures and the speaker is great! it would be better - more helpful - if on the naming test, the words missed/known were named, instead of just the category. Used this app today! Wonderful how the naming component breaks down all the prompts, assisting statistically by # correct by prompt. That data helped the Pt and me to target written word + pic quickly! Thank you! Very Good Use for Adult Therapy! This is a wonderful set of apps for language ans communication skills with both students and adults! You can trust Tactus to make quality apps! Recommended! This app is a life saver! I am currently a school SLP, and I occasionally do PRN work. These 4 apps assist me with targeting the resident's goals, while still keeping my productivity at a high percentage! Plus, it keeps data for you! Can't get any easier! It targets everything! What an awesome app! This is my "go to" for therapy. I have used this app for both adults and children. It can be adapted in so many different ways. Definitely worth getting to use in your therapy toolbox. Very useful app that I feel comfortable recommending. One request. Please consider replacing three pictures on the Naming Test: maid/housekeeper, skateboard, and eraser. The maid and the eraser are not easily recognizable and the skateboard is not age appropriate for most users. Thank you. More IOS Apps by Tactus Therapy Solutions Ltd.